You don't climb or hang from BIKE TOWER-3100. And keep out small babies from BIKE TOWER2. It is your duty that you always adjust the degree of the Frame Hook Beam when you hang another bicycles. 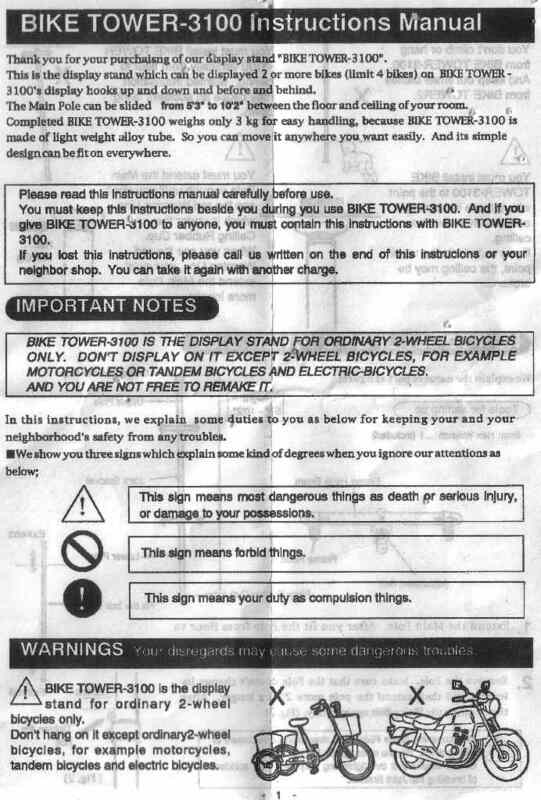 If you felt any troubles about your BIKE TOWER-3100, you must stop using soon. When you waste metal parts, keep away from small children to prevent from some injuries by them. This sign means most dangerous things as death or serious injury or damage to your posessions. This sign means forbid things. This sign means your duty as compulsion things.